Looking for an easy way to receive funds, spend in other currencies, and withdraw cash without big currency transfer fees? Transferwise has a solution. I’ve been using the money transfer service for about 2 years so I figured it was high time I wrote a review. Hint: I’m a fan and I use it every month. 3 What’s the difference between TransferWise and the Borderless Account? 9 Alternatives to Transferwise Borderless? Who can get a borderless account? Accounts are open to everyone but thanks to laws and international regulations. Only some people can apply for accounts in United States Dollars. All European Union or European Economic Area countries are eligible, plus around another 30 countries. Who would want an account? The account is aimed at freelancers, travellers, digital nomads, and holidaymakers. Do you charge clients in a currency other than your bank’s currency? You can save a lot of money with the borderless account's core features. How much To set up and what are the monthly charges? The account is free to set up and maintain. Zero maintenance charges. There must be high conversion fees and terrible rates? No. The rates are very competitive and fees are minimal. In fact, you’ll struggle to find a better deal with other companies. 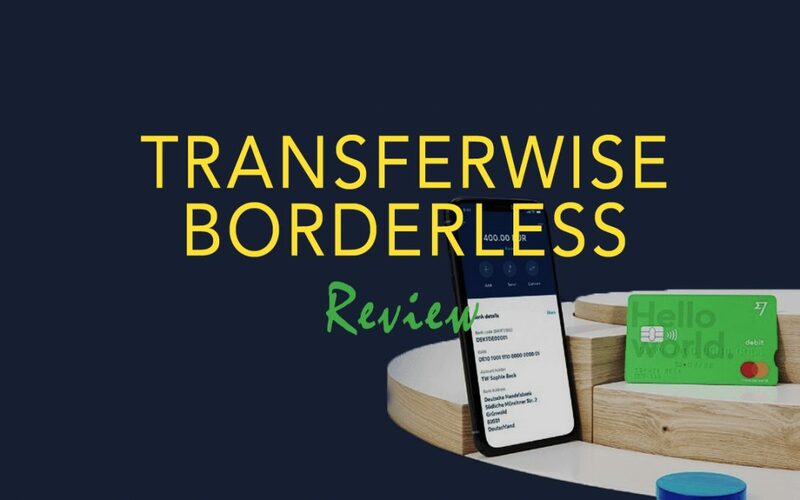 What’s the difference between TransferWise and the Borderless Account? The first is for sending money overseas. The second is a way of holding bank accounts in world currencies in the cloud. You can use these accounts as you would with a regular account in your own country. Pay bills, receive wages, receive client payments, pay for services online with the debit card, and withdraw cash at ATMs at the real local exchange rate. TransferWise’s flagship product is a money transfer service that has become one of the most popular in the world. It’s my personal favourite. The system works like this. Most people use a bank or money transfer service like Western to send money internationally. Fees for doing this kind of transaction are high because international transfers cost a lot of money. At least that's what they tell us. 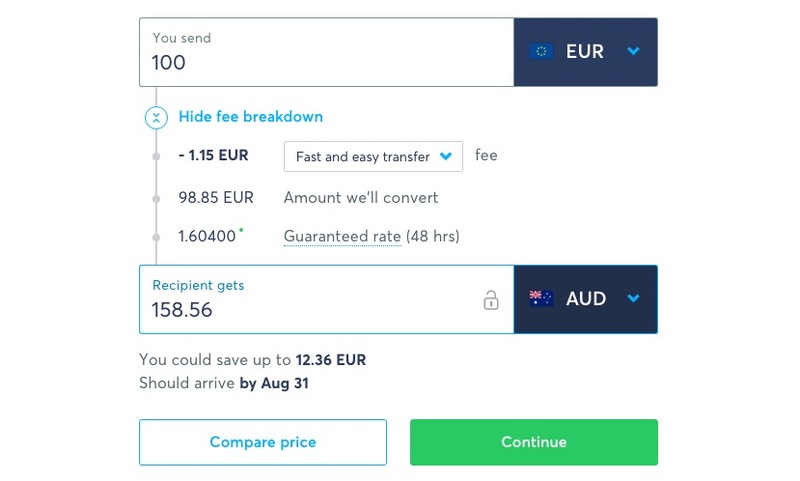 TransferWise offers lower fees and better rates because it uses a two-step process. Two transactions happen for each transfer, one currency transaction in each country. In effect, two local transfers – one in your country and one at the receiver’s country. Local transfers are cheaper than international and they are free in many countries. The savings pass on to you, the consumer. A borderless account is a currency account that lets you send and receive money in multiple currencies around the world. Sending and receiving money using your currencies. It’s like your own personal bank accounts around the world. Banks, for me, are out of touch with the modern world of work. People travel more and expect to transfer money, collect money in different currencies, charge clients anywhere in the world, and pay fewer fees. Transferwise is answering these demands with cloud-based banking technology. 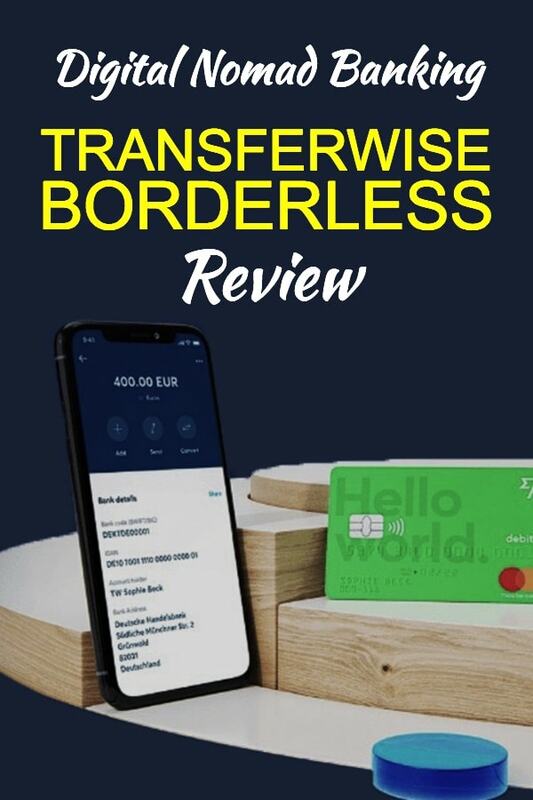 For Travellers: Exchange money in the borderless app or on the Transferwise website and use the international debit card to take out local currency without the exchange rate fees. Change what you need and avoid the banks and money changers. For digital nomads: Imagine having bank accounts all over the world that clients could use to pay you. Instead of requesting that a client pay via international bank transfer or use a credit card, ask them to transfer the funds to a local bank account. It’s simple. You pay no currency exchange fees and nobody gets hit with international money transfer levies. I save time by avoiding banks and worrying about exchange rates (Transferwise has the best rates 90% of the time in my experience). And I can do everything inside the app on my phone. As of September 2018) the service offers 40 currencies but this number is increasing. Want a UK business account but live in the US? No problem? Need a Euro account but living in the UK? It’s as simple to set up as clicking a button. Let’s say you want to open a bank account in Australia. Might be difficult if you don't live there, right? 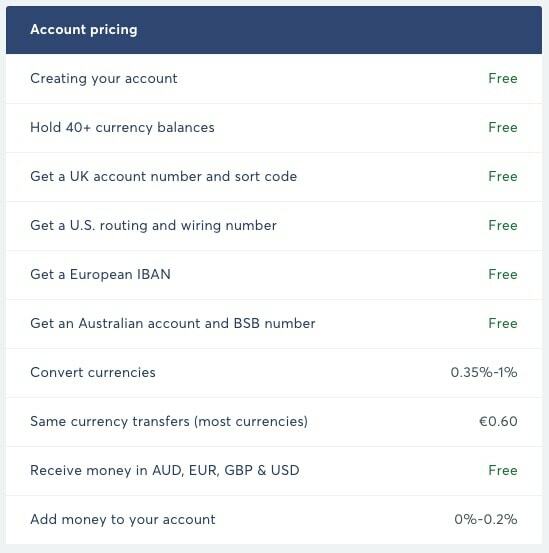 Transfer wise lets you open an account in Australia for free. It’s an online account only, but for most of us, that’s sufficient. I can’t remember the last time I went into a physical bank. Once the money is in your account, you can spend online using your Mastercard debit card. You can also exchange currencies right there in the app. The mobile app can also be a two-step security device for logging into the service from a desktop. Whenever you log into the app with a desktop browser, your mobile phone app will ask for a verification. This can be as simple as a thumbprint scan on an iPhone or a finger scan-enabled phone. I have clients in Australia, New Zealand, the US, and the UK. My bank account is in the European Union. But I can receive payments in local currency from each of these clients. If I want to withdraw Euros, I have to exchange the currency. But if I want to use the funds in the target countries (which I do, regularly) Transferwise charges me nothing. I can also withdraw the cash at ATMs anywhere and just pay the withdrawal fee (instead of the exchange fee plus the ATM fee). Do you use Upwork for freelancing work? Looking for an alternative to Paypal for getting paid in US Dollars? Connect your US dollar account to Upwork and receive finds in the local currency. This isn’t perfect for everyone as some people will want to withdraw most or all of the money they make on Upwork in their own currency. But if you pay for services in dollars and like to hold some cash in that currency, this is a way to do it. Direct deposits to US bank accounts are free so this is another benefit of withdrawing money in USD. Of course, you can receive money from Upwork in your local currency via your local ball account. But will you get the best rate? In my experience, it’s a lot better to perform the exchange inside your Transferwise account. That way you have more control and I guarantee you’ll get better rates. It’s not a bank account. It’s an electronic currency account. A place to store money online in various currencies. Customer service is better than most traditional banks I’ve dealt with and it’s easy to see what you will pay for your “banking” and transfers. Safe and regulated by the FCA in the UK. Funds are stored in low-risk funds in major financial institutions (banks) separate from the funds Transferwise uses to operate. Offers an API to developers and entrepreneurs for integrating low fee currency exchange rates into their software. 2. A small fixed fee applies to every withdrawal from a Borderless account to a non-Transferwise account. TransferWise set the bar high for the competitors with the borderless debit card. A card that can be used anywhere that MasterCard is accepted (almost everywhere) but with multiple currencies is the work of genius. You can enable and disable features of your ATM card from the app or in your web browser. Click a button to freeze your card so it can’t be used. If you’re worried about someone stealing and using your card in stores, disable the contactless payments option. Turn off online payments if online credit card fraud is a concern. You can also enable or disabled Chip and PIN payments and Magstripe Payments on the card. The borderless phone app lets you freeze your ATM card with the touch of a button. You can also reveal your PIN in case you’ve forgotten it and edit your spending limits. You can set 24-hour limits or 30-day limits for withdrawals, general card usage and limits for all the features listed above. The app shows how much you’ve got let to withdraw that month before fees are charged. Transfer wise received a 280 Million dollar investment at the end of 2017. And the business is profitable. So I expect the company to be around for a long time. Your money is stored in a regulated financial institution in the UK and apart from the company's operating funds. Even if TransferWise folded tomorrow, your money would be safe. If I could invest, I would. As a digital nomad banking solution, nothing really touches the service. Alternative services include Revolut and N26. There’s PayPal, but I have a love/hate relationship with the service. My love for the originality of PayPal’s product turned to hate (too strong?) over the years thanks to their eagerness to block my funds, take large fees, and provide one of the worst customer service systems on the internet. I try not to use PayPal, but in a pinch, I use it. Give the Borderless account a try. It's free and easy to set up. You'll love it once you see the money you save.